When it's cold outside we wanna bring summer and caribbean flavor back :-). feel free to share the event and invite your friends! Tina (Rauter): Tina's main stay is urban dance. She uses many contemporary influences in her style of dancing to House music. she loves to take her body knowledge into her classes, to give her students a better understanding of the body and how to develop their own creativity. House Dance: is founded in USA/NYC/Chicago and is a club dance. that's why we wanna give you the opportunity to dance free at the open floor session after the workshops to a live DJ set by TJ Hicks. House Dance is influenced by many different dance styles like Tap Dance, Jazz, Breaking, Hip Hop, Latin dances, Lindy hop, Swing and of course african/caribbean dances. 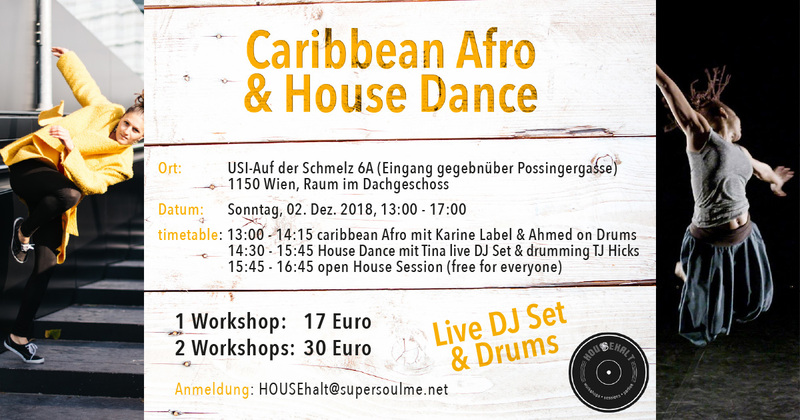 That's why we combine caribbean Afro with House Dance. we will work on foundations and also some creativity work.